Agriculture is Georgia’s oldest and largest industry and remains the state’s top industry today, contributing more than $71 billion to the annual economy. One in seven Georgians work in agriculture, forestry or other related fields. Year after year, Georgia is the number-one state in the nation for production of peanuts, broilers, pecans and watermelons. Georgia also ranks near the top for cotton, cabbage, eggs, melons, onions, peaches, tomatoes, tobacco and blueberries. Producers across the state raise beef cattle, horses, goats, sheep, hogs, turkeys and more. Whether you’re in the mountains of Northeast Georgia or near the Atlantic Ocean in Coastal Georgia, you’ll see something pertaining to agriculture no matter where you go. Agriculture has seen great changes over the years and Georgia farmers have adapted. They continue to provide diverse agricultural products, but farming today is more than just growing crops and raising livestock – a high-tech network of processing, marketing and distribution moves agricultural commodities from the farmer to the consumer. In 2004, the National Farm to School program began connecting locally grown foods with school cafeterias. The relationship between farmers and schools enables students to have access to fresh, nutritious foods picked at the peak of flavor while benefiting local farms and communities. Farm to School programs teach children about nutrition and agriculture through opportunities like taste tests, school gardens, composting programs, on-site farm tours and educational incorporation through projects such as artwork competitions, essay contests and more. School nutrition directors obtain locally grown products by purchasing directly from a farmer, through a farmers’ cooperative or through wholesale distribution. Today, 50 states in the U.S. have operational farm to school programs with an estimated 40,328 schools involved and more than 23.5 million students reached through the programs. Georgia jumped on board in 2007 with its Farm to School Program initiated by Georgia Organics. Georgia’s goals for Farm to School mirror that of the national program. The program brings together many partners: Students, parents, farmers, board members, administrators, nutrition staff, teachers, community members and government organizations. A Georgia Farm to School Alliance was developed in 2009, with representatives from the Georgia Department of Agriculture (GDA), Georgia Department of Public Health (DPH), the University of Georgia Cooperative Extension Service, the Georgia Department of Education (GaDOE), Georgia Organics and the United States Department of Agriculture (USDA) Food and Nutrition Service, Southeast Regional Office. The Farm to School Alliance hosts an annual Farm to School Summit, which began in 2010 and is held in different locations each year. In 2010, the GDA revamped its statewide “Georgia Grown” initiative, highlighting local producers and promoting Georgia products not only within the state, but across the nation and worldwide. As part of the revitalized program, in 2011 the GDA and GaDOE partnered together to implement the new educational “Feed My School” program for students. Feed My School helps increase farm to cafeteria opportunities while working to bridge the communication gaps from the farm to the cafeteria. 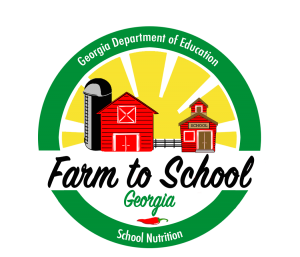 Georgia Department of Agriculture – Learn about Georgia’s Farm to School program, Feed My School. National Farm to School Network – The National Farm to School Network supports the implementation of Farm to nationwide through focused work in the following priority areas: 1) policy development; 2) training and technical assistance; 3) information development and dissemination; 4) networking; 5) media and marketing; and 6) research and evaluation. USDA Farm to School – Operated by the Department’s Food and Nutrition Service (FNS), USDA’s Farm to School program includes seven regional offices around the that provide support to state agencies and other entities in their region. USDA Farm to School Census – Visit the official USDA Farm to School census website to see more statistics and background information from both national and statewide perspectives. Georgia Farm Bureau. “Georgia Agriculture.” Retrieved Oct. 2013, from www.gfb.org/aboutus/georgia_agriculture.html. Georgia Organics. “Georgia Farm to School Alliance.” Retrieved Oct. 2013, from http://georgiaorganics.org/summit/alliance. National Farm to School Network. Homepage (statistics). Retrieved October 26, 2014, from www.farmtoschool.org.